The city of Mashhad, Iran, receives millions of religious pilgrims each year. On Dec. 28, 2017, demonstrations that broke out there reversed that path, quickly spreading to over 90 cities and towns in every part of the country. After more than a week of nationwide demonstrations, dozens of people have been killed, and over 4,000 arrested. Protesters voiced human indignation over sharp increases in the cost of basic food items, unemployment, unpaid labor, government corruption, and proposed higher fuel prices. Women were clearly present and vocal. Most significantly, opposition was expressed to Iran’s genocidal, imperialist war in Syria. Demonstrators were mainly young. Youth unemployment has risen to 28.8% and general unemployment stands at 12.4%. 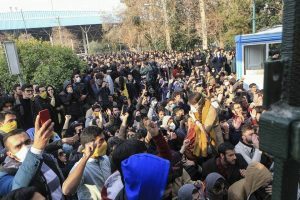 This generation has few illusions about the political structure, and chants and slogans have been directed against both Supreme Leader Ayatollah Khamenei and “reformist” President Hassan Rouhani. 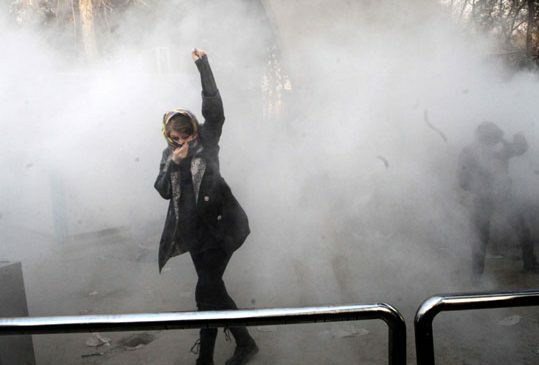 As one long-time Iranian Marxist-Humanist pointed out, this movement seems to begin where the 2009 Green Movement—protesting a stolen election—ended. The world has changed since 2009. 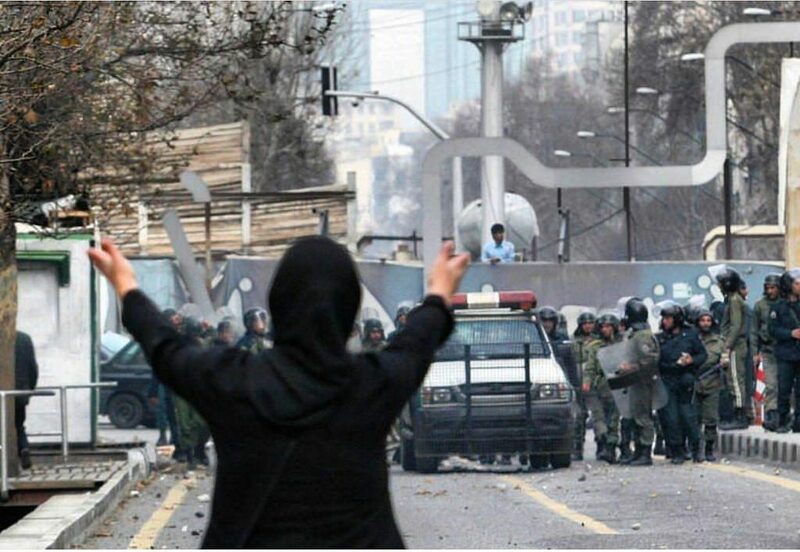 In retrospect, the Iranian regime’s crushing of the Green Movement can be seen as a dress rehearsal for the world ruling classes’ attempted murder of the Arab Spring revolutions. Iran’s war in Syria played a big role in that. The current demonstrations must also be seen in a world context. The international element was there in Mashhad. The city isn’t only a center of pilgrimage, but of industry: autos, chemicals, steel and textiles. Further, it is a center of trade, positioned along the old Silk Road, which is being reactivated with new electric railways underwritten by China. The railroad moves part of China’s $50 billion trade with Iran. It also brings news of China’s oppression of the Muslim Uighurs of Xinjiang, and proof of the hypocrisy of Iran’s “religious” rulers who keep silent about this oppression even as they profit by it. The presence of ethnic Turkmens in the demonstrations has terrified the dictator of neighboring Turkmenistan, President Gurbanguly Berdymukhamedov, who fears that demonstrations will spread there. He has recently introduced some of the same austerity measures, and there have been isolated working-class protests. Vladimir Putin’s regime in Russia worries that the demonstrations might hinder support to the Bashar al-Assad regime. Nicolás Maduro’s Venezuela worries about its oil deals. These youth aren’t nihilists, or “enemies of God,” as the hypocrite regime charges. They see the way the theocrats have reduced “religion” to the most brutal kind of primitive capitalist accumulation, hardly different in essence than ISIS. The Revolutionary Guards that murder Syrian revolutionaries, and destroy Syrian cities, profit by a mafia-like control of Iran’s economy—construction, banking, telecommunications, insurance, hotels and sports. Rouhani coopted the language of the Green Movement for his election campaign, but linked it to his support for genocide in Syria. Indeed, the real difference between Rouhani and the “hardliners” is more a disagreement between this mafia state-capitalism and private capitalists who desire a better relationship with international business and finance. This is much like the split that existed in Turkey that fueled the rise of reactionary President Recep Tayyip Erdoğan’s Justice and Development Party. Iran’s working-class youth rightly want off this treadmill. The most ridiculous thing said of these demonstrations is that they were inspired by Donald Trump. Khamenei doesn’t believe this, of course—maybe nobody could believe it except certain pseudo-leftists who the ruling class has learned to jerk to its will. What Trump has done, with his Dec. 6 provocation “recognizing” Jerusalem as the capital of Israel, is match the Iranian regime in religious obscurantism. It is important to understand the logic of this move: by appointing himself, in essence, “defender of the shrine,” Trump means to place himself at the forefront of the vicious anti-Muslim movement that grew from the Bosnian genocide, Russian revanchism under Putin, and the network of racists and neo-fascists that has entrenched itself in European and U.S. politics. Further, Trump means to consolidate his racist base through an appeal to those religious fanatics who care nothing about Israel as a historic fact, but only as the key to the End Times. These figures were ecstatic at his move. They will duly preach God and Trump. It is a perfect storm of reaction. Trump’s recognition of Jerusalem was done at the expense of the Palestinians. It first destroyed the unity agreement between Hamas and the Palestinian Authority. It also drove a final knife through the heart of the two-state solution—as it was meant to do. In Trump’s mind, it places Israel in a subordinate position as “the West’s first line of defense,” as European fascists and West Bank settlers have long contended. It posits Palestinians as invaders of their own country. The UN objected, but Israel currently has solid economic relations with the U.S., Russia, China and India, and common interests with Saudi Arabia and other states in opposing Iran’s imperialism with their own imperialism. The Iranian youth substituted real human needs for illusory, and increasingly decadent, religious rhetoric. They reached for internationalism in their opposition to the regime’s genocidal imperialism. They have proven once again the revolutionary nature of the working class. These achievements serve to emphasize the responsibility of the revolutionary theoretician. Every new beginning must be made from the absolute. It means that the idea of freedom concretizes itself in real historic struggles and can open new perspectives. In articulating the depth of mass grievances, the movement only begins the hard work of projecting an idea of freedom that can provide a liberatory direction. This initiative can be so articulated by virtue of the historic freedom struggles waged in the Arab Spring revolts and particularly the Syrian Revolution. This is why Marxist-Humanism grasps the struggles in Bosnia and Syria as philosophic categories necessary for understanding the course of history, and opening the possibility of transcending the inhuman contradictions facing humanity. We look forward to further dialogue with a new generation of revolutionaries who have looked into the smile of the bourgeoisie and seen the fires of hell raging there. Together we can create a new language, and a new reality. This entry was posted in Articles and tagged Alliance of Middle Eastern Socialists, Arab spring, Ayatollah Khamenei, Bashar al-Assad, Bosnia genocide, capitalist accumulation, Center for Human Rights in Iran, China, corruption, Donald Trump, Gerry Emmett, Green Movement, Gurbanguly Berdymukhamedov, Hadi Ghaemi, Hamas, Hassan Rouhani, Idea of freedom, India, Iran, ISIS, Israel, Jerusalem, Justice and Development Party, Kermanshah, Marxist-Humanism, Mashhad, Nicolas Maduro, Palestinian Authority, Palestinians, protests, Recep Tayyip Erdoğan, Revolutionary Guard, solidarity, state-capitalist, Syria, theory, Trump’s anti-muslim agenda, Turkey, Turkmen, Turkmenistan, U.S., Uighurs, Unemployment, Vladimir Putin, women, workers, Xinjiang, youth. Bookmark the permalink. Bosnia is a warning Gerry brings up several times here. The existence of a multicultural, non-chauvinist force in Sarajevo and throughout Bosnia was never really communicated by mass media who had an interest in projecting the tired argument that these age-old religious and ethnic conflicts will just be smoldering forever. We cannot allow the Iranian ruling class in its duplicate factions, i.e., two-headed religious and secular factions of the capitalist ruling class, to fool the Left again, as Milosevic, Assad, Maduro, et al. We’ve got to listen lower and deeper.